NEW YORK — Harold Connolly, who overcame a withered left arm to win the hammer throw in the 1956 Melbourne Olympics and then married the women’s discus champion, Olga Fikotova of Czechoslovakia, after a storybook Cold War romance, died Wednesday in Catonsville, Md. He was 79. Mr. Connolly was at his gym doing his regular workout on an exercise bicycle when he passed out, said his second wife, the former Pat Daniels, a three-time American Olympic runner and pentathlete. He apparently hit his head on the concrete floor and died, she said. When he won his Olympic gold medal, photographers yelled at him to raise his arms in triumph. He lifted only his right arm. Harold Vincent Connolly was born Aug. 1, 1931, in Somerville, Mass., and was raised in Boston’s Brighton neighborhood. He paid his own way to Boston College, where he was a mediocre shot-putter. When he retrieved hammers in practice and threw them back farther than the hammer throwers had thrown them, he was switched. He graduated in 1953 and later spent 30 years as a high school teacher and vice principal in Santa Monica, Calif., and 11 years as a Special Olympics executive. The hammer is a 16-pound metal ball attached to a handle by a chain almost 4 feet long. The thrower spins three or four times in a ring and flings it. What Mr. Connolly lacked in arm strength, he made up for with speed and leg power. Mr. Connolly competed in four Olympics, finishing eighth in 1960 (“Too much pressure,’’ he said) and sixth in 1964 and not qualifying for the final in 1968. In 1972, he finished fifth in the US trials and failed to make the team. In an event in which Americans seldom do well, he broke the world record six times, starting with 218 feet, 10 inches in 1956 and ending with 233 feet, 9 inches in 1965. Now, with improved training, coaching, and technique, the record is more than 284 feet. 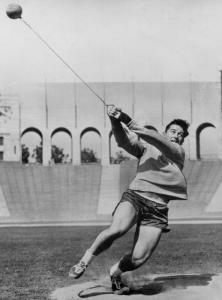 Mr. Connolly won nine US titles in the hammer throw and three in the indoor 35-pound weight throw. In 1984, he was elected to the National Track and Field Hall of Fame. Mikhail Krivonosov of the Soviet Union, the world record holder and silver medalist, put his hand on Mr. Connolly’s hip, turned him, and saved the day. Earlier at those Olympics, Mr. Connolly met Fikotova. A romance ensued, and the next year he went to Prague and received permission from the Czech president to marry her. They were married in three ceremonies there, with a celebration before 40,000 well-wishers. They were divorced in 1974. In 1975, he married Daniels, who became the coach of Evelyn Ashford and other outstanding runners. Besides his wife, Mr. Connolly leaves four children from his first marriage: two sons, Mark of Las Vegas and Jim of Marina del Rey, Calif., and two daughters, Merja Connolly Freund of Corona del Mar, Calif., and Nina Southard of Costa Mesa, Calif.; two children from his second marriage: a son, Adam of Silver Spring, Md., and a daughter, Shannon Podduturi of Manhattan; a stepson, Bradley Winslow of San Jose, Calif.; and five grandchildren. Jim Connolly was the NCAA decathlon champion for UCLA in 1987, and Adam Connolly was America’s third-ranked hammer thrower in 1999. After retiring in 1999, Mr. Connolly became a traveling coach and salesman for the hammer throw and ran the website hammerthrow.org. In 1983, he wrote in The Times that he had used anabolic steroids for many years, before they were illegal. He said he did not know if they had helped his performances. A year after he stopped using them, the 250 pounds on his 6-foot frame had dropped to 203. In later years, he opposed the use of steroids.